A 5 hour trip, during of which we will see pilot whales and bottlenose dolphins, an internationally species. The SHOGUN complies with these rules and holds a yellow flag with a “blue boat” badge that guarantees the sight seeing of the whales and dolphins with their maximum welfare involved. Whale & Dolphin Watching boat trips by SHOGUN Ship starts from Puerto Colon at approx. 11:00 AM (depend on Pick Up point) every Monday, Wednesday, Thursday, Friday and Sunday and the boat stuff speak a few languages. 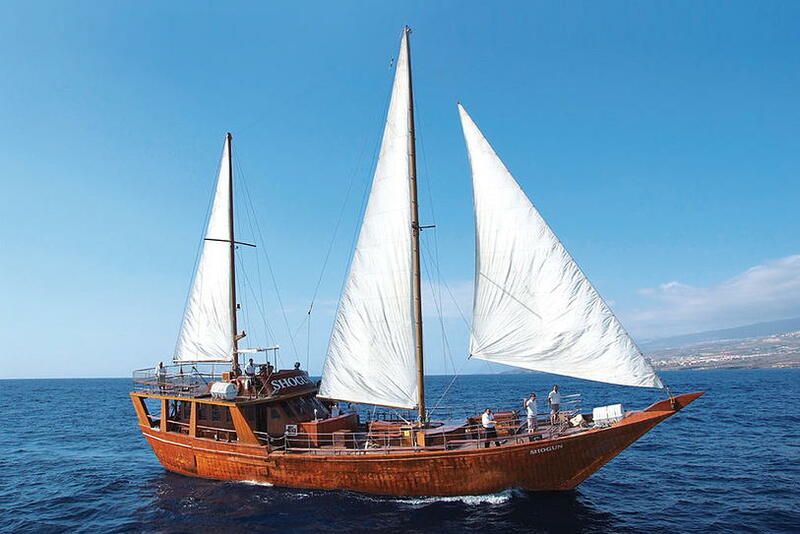 In order to make your booking of SHOGUN Ship Boat Trips in Tenerife easy and comfortable Tenerife Host use the most advanced and user friendly booking platform TripsPoint.com where you can easily check last actual prices, the tour availability, required booking deposit and book this tour. To get more information of SHOGUN Ship Boat Trips in Tenerife and do booking, please, click the button ‘Book Now’. You will be taken to the tour page at TripsPoint.com where you can easily book the tour. Once the booking of SHOGUN Ship Boat Trips in Tenerife made at TripsPoint you will get your tour Voucher / booking confirmation with all details, including exact pick-up point, pick-up time and map. The price include bus transfer to the harbour, 5 hours sea trip, Whales & Dolphins watching (the warranty you’ll see), lunch, soft drinks and alcohol.